The second major group of process models we will consider are change (growth) curves, and other cycle models. Unlike our personal and organizational decisions, which we have just covered in decision cycle models, these models describe systems that are often even bigger, and thus even less in our direct control. Yet as leaders, we can influence every system to the extent we understand it, and can help others understand it, and its leverage points. As Marcus Cicero said, “To be ignorant of what occurred before you were born is to remain always a child,” and as Mark Twain said, “History never repeats itself but it rhymes”. Many complex systems change in ways that can be fit to historically documented curves, cycles, and other simple models. While our change models take ideal and regular forms, real world changes and cycles are more irregular and probabilistic. Nevertheless, whenever we can identify probabilistic relationships, we greatly improve our forecasts, predictions, and strategy. Very often, replication of something interesting (organisms, information, economic behaviors, technologies, ideas) seems to play a central role in creating these relationships, in some kind of evo devo cycle. Of course when we think of replication, we should also think of life cycles. Everything in this section can be considered an application of cycle theory, whether the cycle is obvious (a production of a new widget) or less so (some type of learning cycle, or Do loop). For good introductions to cycle foresight, try Dewey and Dakin’s classic Cycles: The Science of Prediction (1947/2011). 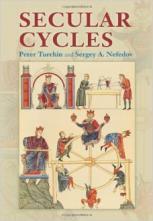 If you’d like evidence for social, economic, and political cycles, start with Turchin and Nefedov’s Secular Cycles, 2009, one of a trilogy by Turchin on this topic. Carlota Perez’s Technological Revolutions and Financial Capital (2003), building on the early long-wave cycle work of Kondratieff and Schumpeter, is another well-regarded book that looks at technology from both a cyclical and developmental perspective. One of the simplest cycles we can observe is a pendulum, where a system swings regularly or irregularly between two poles or categories. A regular pendulum is Earth’s day-to-night cycle, an irregular one is our boom-or-bust market cycle. There are also many systems with more than two phases in their cycle. Earth’s seasons have a regular four-phase cycle (Winter, Spring, Summer, Fall). Economies have irregular alternating phases of increasing then decreasing income inequality. Organizations often move irregularly from Adolescence to Peak Performance to Bureacracy. Products often have an irregular six-phase life cycle (Birth, Rapid Growth, Declining Growth, Maturity, Decline, and Death). In this section we’ll tour an alphabet soup of interesting growth and cycle curves, including B-, C-, E-, S-, J-, L- and U-curves. Systems theorists are always looking for curves that show predictable behavior in many classes of systems. Futurist Charles Fadel teaches a great course, Ten Curves that Explain the World, to freshmen at Harvard. His ten curves aren’t a full menagerie, and they don’t include some of the ones you’ll see below, but the idea is excellent, and it informs this section of the Guide. There are a number of classic curves that will tell you predictable things about a system’s development, sometimes over the short term, sometimes over centuries. Once you know a curve or a cycle exists and is operating, you can look for a predictable succession of phases, even if the duration of each phase seems irregular. In many cases it may be the smartest strategy to simply try to get faster at sensing and reacting to the expected next phase of the cycle, when it comes, rather than trying to predict the exact time of its arrival. But identifying the curve and the cycle can give you a major competitive advantage. Different strategies and tactics will often be most adaptive in different phases of any change cycle. You don’t want to be buying when the market is high, or selling when it is low. Noticing when a cycle is operating, determining which phase you are in, knowing which behaviors will work best for each phase, and being ready to quickly shift your tactics, strategies, goals, and sometimes even your organizational structure when the next phase occurs are all ways to use cycle foresight to gain strategic advantage. Let’s look at a few change or life cycle models and phases that can be helpful in foresight practice.